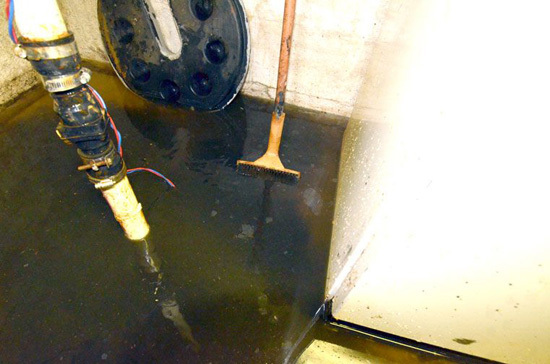 If you have a home or commercial property that requires the use of a sump pump to eliminate underground or above ground water from entering your basement, then you know what could happen should you have a storm and a power outage. 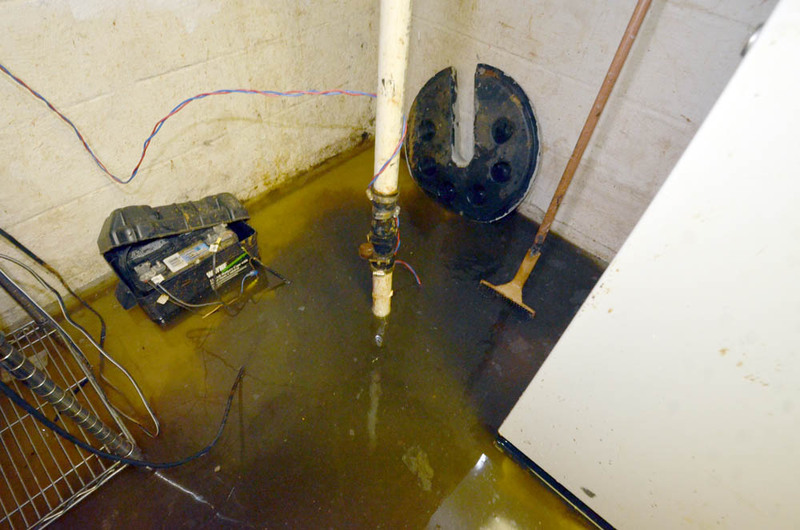 Len Rapoport, IPA President and author of this article describes his personal problems keeping his basement dry and his discovery of a back up pump that doesn’t need electricity to operate. Read this informative article and find out how to keep your home safe even without electrical power. See the complete how-to install video that will show you how to get one of these systems up and running in your home or business. 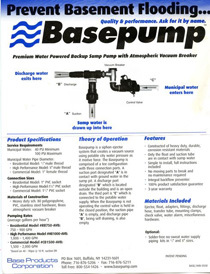 The Basepump system can be installed by a handy homeowner or with the help of a plumber. Over the years, I have had to deal with basement water problems. Unknown to me, when I purchased my home 30+ years ago, the house was located over an underground stream. Now my underground stream is not as glamorous as you may imagine. It deposits water in my sump and which has to be emptied at least once every 15-20 minutes, so my pump does a lot of work to keep my basement dry. Over the 30 years I have had waterproof companies come in and promise to solve my problem by installing French Drain’s and other variations of the many waterproofing schemes, but many simply didn’t work. A French drain is basically a trench around the perimeter of a basement that collects the water and directs it into a sump where the pump will remove it to a homes exterior or in my case a 4″ pipe leading to my streets storm drain system. Now my problem was not simply getting rid of gallons of clear water, but rather one that was complicated because of a high level of iron in the earth that the water flowed through to reach my sump. My sump water always appears to be orange in color and the rust in the water forms a muddy slime that will clog my sump pump and discharge line over time. After spending close to $30,000 and three failed attempts to find a solution, I discovered the best way to deal with the problem was to purchase a product called Super Iron Out, pour some in the sump every few days and it would turn the orange water clear as if by magic. From the manufacturers web site we see that Super Iron Out chemically changes rust and iron into a clear, soluble state that easily rinses away without scrubbing. So my job has been one of constant maintenance and removal of my main sump pump to clean the residue two to three times each year. Now back to my solution to prevent flooding…they say that the third time is a charm and the last time I redid my basement, I took lots of precautions to make it impervious to a flood or water damage. We stripped everything out of the basement and rebuilt it with mold resistant green sheet rock (used for bathrooms and damp applications). I purchased carpeting that would resist flooding, I even sealed the room in plastic and used water resistant sub-flooring. I then bought a top of the line Little Giant Sump Pump…easy to clean and built like a tank, a $300 battery backup pump (includes battery) and an electronic sump pump control that turns the pump on when the wire in the sump is hit by water. If the water level in the sump reached a higher level a second wire triggers a loud alarm. But alas all of this didn’t help me when my main sump pumps electronic switch failed and my battery back-up couldn’t handle the load. I usually check my basement every few days, but forgot to do so in February of this year. The snows were so high and the water kept pouring into my sump each day. On February 15th, I went down the stairs to my basement and found it was under water. I discovered that the two wires going to the switch, one that turns on the pump and one for the warning alarm had pulled out of the main unit. So when the pump failed to go on, the loud alarm meant to warn us, also failed to activate. The two hard wires from the switch to the pit had a poor push on type connection and I must have dislodged them when I was doing some pit maintenance. I am thankful that I have the best insurance company, USAA. 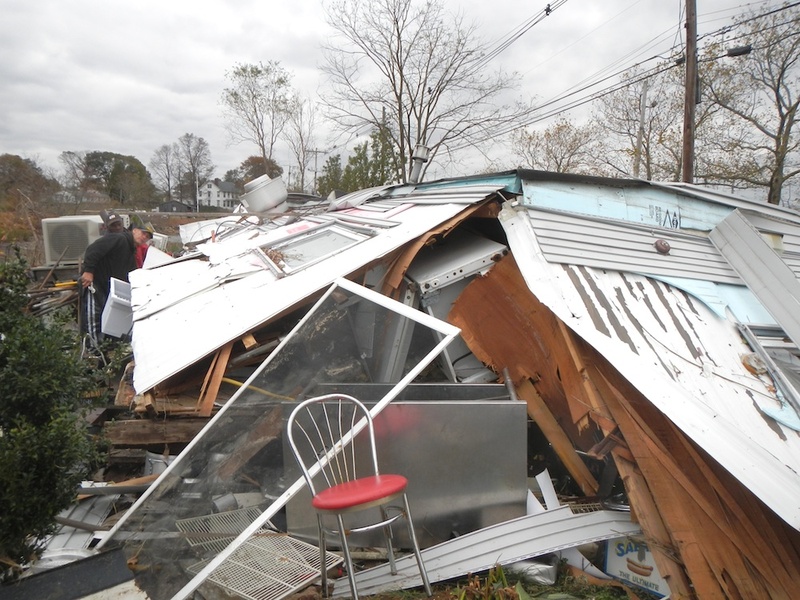 They immediately took care of the claim, sent an adjuster who assessed the damage and in days, they had transferred the thousands of dollars required to do the clean up and repairs to my bank account. I knew I had to find a better solution, since the last one simply couldn’t be trusted to work in an emergency. Imagine that your home and safety could be jeopardized by a simple accident like mine or a mechanical or electrical failure. It makes it very difficult to leave the home for a vacation or trip not knowing what you will find when you return. There is no battery back up, I know of, that can continue to operate in a disaster or when your electrical service is down for a day or longer as is the case now with so many of us. This past winter we had over 36″ of snow that stayed with us for months as the snows continued to fall each week. Electrical outages were a given and on many occasions I found myself down in the basement manually removing 5 gallon buckets of water so the sump wouldn’t overflow into my finished basement. I wanted a system that didn’t depend on use of the same discharge pipe as my main pump. After all, my rusty water could clog up my discharge pipe too. I also was concerned about having another switch fail or possibly an mechanical issue with the main sump pump. 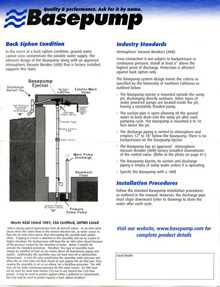 Doing what I do best, I got on the net and began to do my research and found a company that produces a water powered back up sump pump called Basepump. Base Products was formed over 10 years ago to solve a problem that has had no absolute solutions before. They state that their “mission is to use current technology, time-proven principles, and high quality, long lasting materials, to design new and better solutions in the Flood Prevention industry. Our goal is to design and package products that include everything the installer needs”. Bill Bonifacio, their President and founder, created what I believe is the best product of this type in the market. Simply stated, it works, it is relatively inexpensive and costs less then many of the battery operated systems which also require deep cycle batteries to work. Installation can be done by the homeowner (those comfortable with plumbing) or as we did a good plumber familiar with this type of product. Of course there are some other water powered pumps but the Basepump outshines them all. 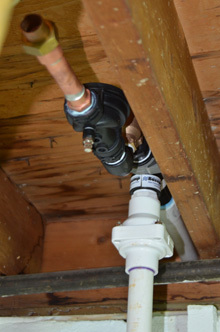 Using a homeowners cold water line, this pump won’t fail in an electrical or mechanical outage, because it is so simple with almost no moving parts and is ingenious in its design and construction. The Basepump is also the premium system because it can pump two gallons of sump water using only one gallon of tap water and it can empty the average sump pit in 30 seconds or less. I decided to call Base Products and reached Jim Belle who handles the companies marketing and also handles some of the customer service and sales calls. He walked me through the systems installation and workings and I thought this was such a great product and a logical solution to my problems. I began to fantasize about the trips I take for IPA or the ones to Florida to visit my family. This pump could give me peace of mind while I was away from the house. 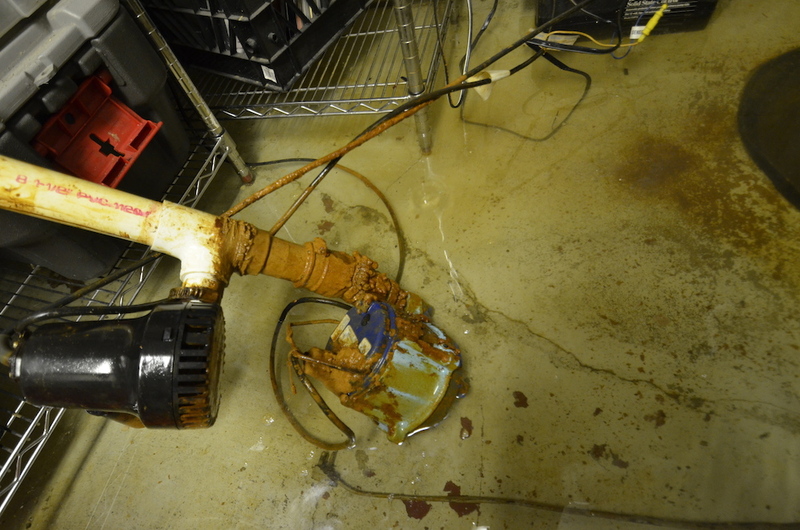 In the thirty years in this home, I have always been concerned about a sump pump failure and have arranged with family or neighbors to look in from time to time to check the basement. I had truly become a prisoner to my homes sump. The light bulbs began to light up as Jim explained the system to me. I suggested that his company and the Basepump could make a great story to share with others that have the same problems I have in their homes or businesses. I offered to review the Basepump, produce an installation video and let others see why I was so excited to find this product. Jim agreed with the plan and off I went to figure out who was going to do the install. Of course I am a really good DIY guy, but I knew that I wanted to get a pro in and then I would be free to produce the video. The plan was to introduce the product and the ease of installation to others. A clear step by step idea of how to either install a pump in their homes or if they didn’t fell comfortable doing it themselves, a suggestion to call a professional plumber to do the install for them. 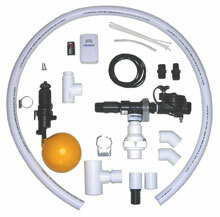 Base offers a number of optional “No Sweat” plumbing kits and items that will enable an individual to cut into their plumbing lines and do the installation with pressure fitted components, but for me, I wanted a pro to do mine. Since I live in Momouth County, New Jersey, one company came to mind. It was the A.J. Perri company located in Tinton Falls, NJ. 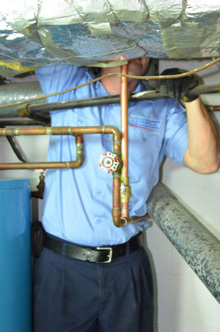 This company has over 40 highly trained plumbers on their staff and a many other skilled service and installation personnel that can handle all heating, cooling and of course plumbing challenges, both commercial and residential. I made a call to Debbie Kern, A.J. Perri’s office manager and the person that handles my type of request. You see, I not only needed a great plumber, but one that would be comfortable on camera and might even enjoy this project. Debbie reached out to Kevin Perri and Louis Malvasi, their plumbing manager and they all agreed that Ed D’ Amore was the man to do the job. We scheduled a day for the installation and I cleared out my basement room, got my lights ready, and as soon as Ed showed up at my door, I knew this was going to work out exactly as planned. Because of some scheduling issues, it took portions of two days to complete our project and get the video and photos I needed to make the video, but I was pleased with the results and hope my readers will find that the Basepump is the only logical solution for their backup sump pump needs. I don’t want to go into too much detail in this article and felt links to both Base Products and A.J. Perri would make more sense. At the Base Products website you can see all the technical information, installation instructions, sketches and prices on the RB750 (the pump I had installed) and their other pumps and accessories. Their tech support is excellent and I found Jim the go to guy as the questions arose and the installation was in progress. A.J. Perri and Ed D’ Amore, were truly the professionals I had expected and not only were wonderful to work with, but frankly, I was so impressed with the manner in which Ed worked and the final results that I would give them a hearty 5 stars or thumbs way up and would recommend anyone in their service area in New Jersey call them and arrange the installation. Although I would consider myself a pretty handy fellow with years of experience working on projects in and outside my home, plumbing was not one of the trades I felt comfortable with. I shutter thinking about cutting into my main water line and then trying to figure out the path the copper pipe is going to run to reach the pump. For me it would have taken days to just be sure I didn’t mess it all up, for Ed, it took hours. You know the feeling you get when all parts of a project come together they way they should? Well this one did just that. I was able to introduce the Basepump to A.J. Perri. Ed confirmed that this pump was the best one he has installed. He has installed others, but this is the only one that only uses one gallon of water to pump two gallons of sump water and the installation and product quality was excellent. You can download and read their complete installation manual by clicking here. Jim at Base was happy to be able to recommend A.J. Perri to handle their installations in New Jersey and help others around the country do the same. For A.J. Perri, the Basepump represents a better premium solution for all of their sump pump home owners and a new product they could install with pride and of course generate new customers and new revenue as an authorized Base Product distributor and installation firm. I have tested my system and it works flawlessly. Since I empty my sump water into a main pipe that leads to our town’s storm drain system, I have no fears of clogged pipes, failed back up systems and of course power outages. I hope that the two companies will use this opportunity to develop a strong relationship. After 30 years of living in my home and dealing with more floods then I would like to remember, I can now breath easier knowing that I no longer have to worry and that when it is time to finally move on and sell this home, I can assure a new owner that they will not have to worry about the sump or flooding, because I know that the Basepump will never let me down. The models with the AVB must discharge downhill and away from the Basepump and open to atmosphere on the exterior. 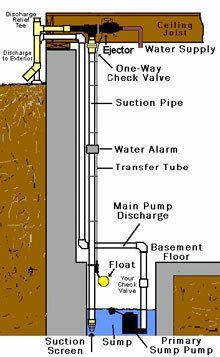 Even when the discharge goes into a larger underground drain pipe, the connection between the smaller pipe from Basepump to the larger pipe in the ground should not be a sealed connection, but have an air gap, as any sump pump discharge should have, including the main electric one. If not installed this way it is possible that any remaining water in the discharge pipe, after the pump shuts off could flow back to the Basepump by gravity and spill out of the AVB valve onto the floor. The reason for the open pipe outside the house is because we want that remaining water to flow outside by gravity and in the case of a clogged discharge pipe, having an air gap on the outside pipe enables the water to flow out of the house and not back in. Although they include a pop out plug, it fits tight and may not pop out as designed because it can end up creating an air tight seal in time. Read the instructions a couple of times before your installation to get familiar with how the system works and you will be in good shape when you do the actual install. Hurricane Irene hit my town and the water was flowing from my sump pipes like an open faucet. I estimate we were pumping over 60 gallons per minute. Although my main pump was working during the night, if my power had gone out I would have been in 4 feet or more of water. I did take my pump out during the storm to do a fast clean out of the muck in the bottom of the pump to be certain it wouldn’t fail during the storm. The basepump kicked in during that time and kept me dry while cleaning the main pump. On a visit to my local post office the next day, I was discussing my Basepump with the clerk who asked me for more info and I gave her my card to see my review on our main site and then another woman over heard me and asked for my card as well because she had lost power and wasn’t sure when it would be restored. Now this was an unusual situation that hopefully will not happen for many years, but it did make me realize that we could lose power at any time and if I didn’t have the Basepump installed I would have had major problems. One last thought…if you want double protection, you can of course install a battery back-up system and the Basepump too. Of course it might be overkill, but this way no matter what the problem, you know you have protection. See another video produced by Base on YouTube…This video gives you more tech data and info on pre-qualifying your home for installation of this product and actual installation. A fast update as I am still without power…I wanted all of those reading this article to know that my Basepump has been pumping out the hundreds of gallons of water that have been pouring into my sump for the past 4 days since Hurricane Sandy hit our home in New Jersey. We have left our home to spend a few nights with power at my son’s apartment in New York City. Our basement is dry, the pump as been going on every 15 minutes or so and I can only hope power will be restored soon. If not I can be sure that my Basepump will continue to protect our home that would have been totally flooded by now. I have video and photos and will upload them once I regain power and can use my computer. My neighbors have told me they are filled with water as a result of the hurricane, and we are totally dry. Thank God for Basepump. Hi. Great article. Very helpful. 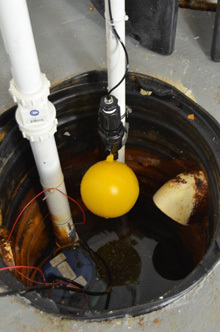 What kind of overall cost should we expect to pay to have one of these water-powered sump pump backups installed? Thanks so much. I am not sure. As you can see in the video we had A.J. Perri do the work for this video. I didn’t have to pay for the installation because of the video and article I wrote. Same with the pump. It did take some time to do the work so I am sure it would cost about $300 depending on your situation. Check with them and ask them the approximate cost. The pump with the easy installation kit is $300…Check their website for more details, I am sure they have info on installation costs as well. 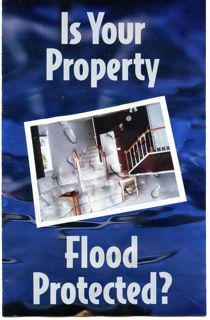 Whatever the cost, a flooded is basement can cost thousands to repair…so whatever the cost you need to do this.